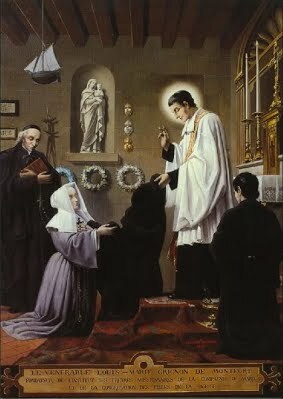 Saint Louis Grignon de Montfort, Priest - My Catholic Life! The English writer Graham Greene grew up Anglican with the typical anti-Catholic biases of his twentieth-century generation. One of those biases firmly held that Catholics worshipped the Virgin Mary and thus deflected toward Christ’s mother the glory due to Him alone. But when Greene started dating an educated Catholic girl, she taught him that Catholics rendered latria (worship) to God, dulia (praise) to the saints, and hyperdulia (an abundance of praise) to Mary. It made sense. Worship is given to God alone. Praise is given to the saints. And Mary is rendered a unique intensity of praise in recognition of her unique role in salvation history. Graham was convinced. For these and other reasons, he entered the Church. He went on to become a well-known novelist on Catholic themes, in part because a teenage girl he once dated knew some basic theology. Throughout the centuries since the Reformation, Catholics have been accused of granting to Mary what is due only to God. This false accusation is more apparent than real. But its appearance sometimes even bothers Catholics. As a young man, the future Pope Saint John Paul II wondered whether he gave Mary too central a role in his devotions, prayer, and reading. But the writings of today’s saint, Louis de Montfort, helped the young Pole place Marian devotion in its wider theological context. Pope Saint John Paul II routinely gave thanks to Saint Louis de Montfort’s book, True Devotion to Mary, for helping him develop a more mature Marian spirituality. The Pope even borrowed from de Montfort the Latin Totus Tuus as his papal motto. De Montfort had written to the Virgin, “I am all yours, and all that is mine belongs to you.” When we honor Mary, Mary honors God along with us. Louis Grignon de Montfort was never not in love with God. He was one of eighteen children born to his parents. Eleven of them are saints—Louis and ten of his siblings who died as babies shortly after their baptisms. Even as a child, Louis was devoted to prayer before the Blessed Sacrament. He studied under the Jesuits as a teen and then attended theology courses at St. Sulpice in Paris. He was ordained a priest at the age of twenty-seven. He at first wanted to become a missionary, like so many ardent French priests of his time. But a spiritual director advised against it, and Louis became a hospital chaplain, preached missions, and served as a confessor. Father Louis was interpersonally awkward and ardent to the point of making others uncomfortable, all of which confined his priestly ministry to non-traditional forums. He also lived radical poverty, owning nothing, carrying no money, and even abandoning his family name, Grignon, to be known only by his town, Montfort. Louis de Montfort’s intense devotional life, theatrical preaching style, moral uprightness, and visions of Mary, the angels and satan, were interpreted as holy foolishness by many in the Church who wished him ill. The Jansenists, an ultra-rigorist branch of the French Church, particularly despised his preaching on God’s love and mercy. Saint Louis’ itinerant life ended due to physical exhaustion at the young age of forty-three. He practiced such extreme physical penances that his body was well prepared for the grave when he died. He was a priest only sixteen years. It is possible that his life and writings did more good for future ages than they did for his own. His writings on Mary, in particular, were rediscovered and published in the nineteenth century, leading to his canonization in 1947 and to his wide fame in the Church. Our saint died with a statue of the Virgin Mary in one arm and a crucifix given him by the Pope in the other arm. He felt attacked by the devil in his last agony and yelled at him, “You attack me in vain. I stand between Jesus and Mary. I have finished my course. I shall sin no more.” He was buried, per his request, under an altar dedicated to his Lady… to Our Lady. 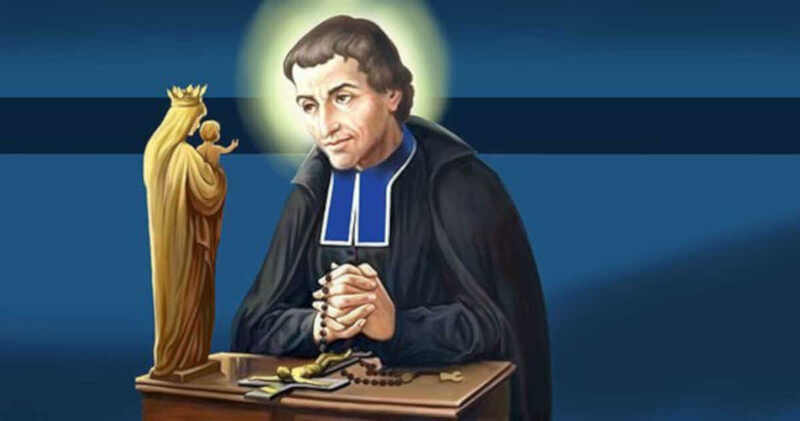 Saint Louis de Montfort, we ask your intercession before God in Heaven to inflame in all hearts a fire that burns like yours with love for the Holy Trinity. Help all who read your works to profit from their wisdom, and so grow closer to God’s mother.